The Madness Continues is the second scenario of Session 2 of the Arkham League. It was first published on February 26, 2009. No clue tokens start on the board. Any unspent clue tokens from the last scenario are placed on the Bank. These clue tokens may be taken from the bank by any investigator as their encounter. The investigator may take as many or as little as they wish each encounter. Clue tokens do not appear due to Mythos cards, skip that line when reading the Mythos card. Instead, whenever an investigator defeats a monster, they gain clue tokens equal to the monster’s toughness. No investigators begin the game with clue tokens. The investigators win by sealing 6 gates, closing gates equal to the number of investigators plus 4, or by defeating Ithaqua in combat. 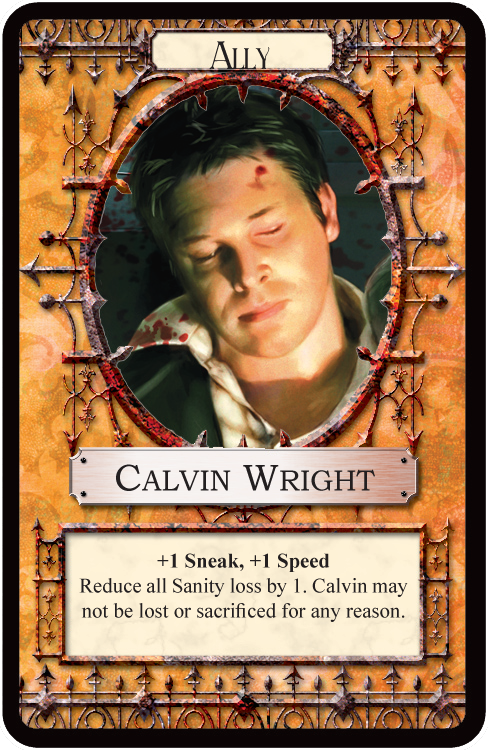 One Investigator must take Calvin Wright as an ally. He replaces one unique item. Only investigators that begin with a unique item, either random or fixed, may take Calvin as an ally. Investigators do not start with any clue tokens. And no they do not receive any compensation, as they get to use whatever they had saved up from Scenario 1 at the bank. Monsters only provide clue tokens if they become trophies, so the Warlock and Endless monsters do not provide extra clue tokens. These clue tokens are received upon defeating the monster, the trophies are not traded in for clue tokens. I reawaken in a doctor's office. A young man, I assume to be the physician, is ministering to another young lady seated on the other side of the partitioning curtain. "Is it tender here sister?" The man presses on the woman's shoulder, and she winces in pain. "I guess so. Next time you see someone in trouble, you go for help. I have bandaged you up a couple of times now." I must have made some noise at this, as the man turned back to me. "My name is Dr. Lee. Your friends say you passed out at Velma's. Care to elaborate on what a healthy young man is doing that would cause him to pass out at a diner?" I scratch my head, wince at the unexpected pain, and begin to explain. I tell him of the attack on my town, cursing the men who took my Ella, and begin speaking of the chance meeting of newfound friends. The more I speak, the more the woman in the next bed grows restless. "Doctor, I really must insist I be allowed to leave. The work of the Lord does not wait for anyone, and I fear the longer I am here, the forces opposing me grow." Smiling he gives the young lady a scrip and sends her out to the front. "Sister Mary is one of the hardest working people in Arkham, and that is coming from a doctor." I ask after my compatriots, and am told they are awaiting my convalescence outside. The good doctor pronounces me fine, and sends me out to the waiting area. As I exit, I spy Jenny talking with Sister Mary. As I walk up the conversation ends and they both look my direction. "How are you feeling, sugar?" I wave off the concern, and inquire as to our next step. "Joe is on it. He says he has some people he knows. A visiting professor, someone he heard was in town. Don't sweat, I know Joe." Still feeling apprehensive, we head out into the waning afternoon sun making our way back to Ma's. Night falls, and my fears grow. Each creak, every rustle sends chills up my spine. Cursing myself for cowardice, I make my way down the hall towards McGlen's room. I knock lightly on the door. "Come in." I open the door, and poke my head in. "Can I help you?" I introduce myself, and reference carrying him down the hall. I tell him my story, a story I find grows in horror with each retelling. I then tell him that I fear for my life, and would appreciate his protection. "Well, I ain't much for protecting people. I'm more in for hurtin' them. You see my partner Louie and I..." McGlen recounts the tale of his partner disappearing into the river, and the fruitless search for his body afterwards. I listen, but keep glancing at the window. I hear the sounds of movement under it. McGlen stands and walks to the window, seeing my nervousness. "Ain't nothing out there. Just somebody's dog or somethin'." As he looks out the window, he back pedals nearly knocking me over. "Damn it, I swore I was gonna kill that thing once and for all. Grab your coat, we're going hunting." I run back to my room, confused and terrified. I can't go outside to hunt whatever it is McGlen has seen. I am no fighter, I haven't a weapon. I was imploring him to protect me. McGlen pops in my room, and seeing my fear tells me to stay put. He has a score to settle. He heads out into the night, carrying his gun. I cower under my bed, hoping nothing enters my room. head out of McGlen's room. "I do a spot of cleanin' for him now and then. Big lug always seems to find trouble." She heads off down the stairs as Jenny emerges into the hallway. "Mornin' Calvin. Sleep all right?" I quickly tell Jenny of the events of the night prior. "Well nothin' we can do about it now. I guess we can ask Joe about this McGlen fella." We go downstairs, eat the breakfast that Ma has spread out, and head out into Arkham. Apparently, Jenny has a meeting with Joe at the local university. Some professor she is supposed to talk to. This page was last modified on 23 December 2009, at 09:07.